Campus police sit idly as Jerusalem Mayor shouted down during SFSU talk by anti-Israel activists chanting "intifada, intifada". 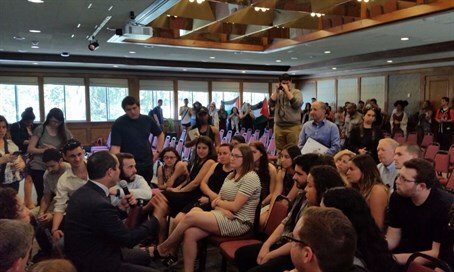 Jerusalem Mayor Nir Barkat received a rude reception on Wednesday, when anti-Israel activists crashed his public appearance at a California university. Barkat was scheduled to speak on Wednesday afternoon at San Francisco State University’s Seven Hills Conference Center about his background in the high-tech sector and how those experiences have helped him as mayor of Israel’s largest and most diverse city. The venue for the talk was chosen because of its proximity to the Silicon Valley, an area known for its high concentration of high-tech firms. Only minutes into his speech, however, anti-Israel activists aligned with the Students for Justice in Palestine movement entered the conference hall, chanting slogans and shouting down Barkat. ampus and city police were called, yet they stood idly by, allowing the unruly protesters to drown out the mayor’s address. As can be seen in the video, audience members began clearing the hall, leaving it largely empty. Barkat eventually left the podium to sit amongst those few who remained. SJP activists waving the PLO flag cheered on the current wave of terrorism against Israelis, chanting "long live the Intifada". Other slogans included "From the river to the sea, Palestine will be free", a thinly veiled call for the destruction of Israel.